Property 4: Charming cottage for your holidays, quiet sea proxi, large beach. Proxi The Sands. A mobile home O'Hara for 4-6 persons in an attractive holiday park 300m from the Atlantic coast. Property 9: A mobile home O'Hara for 4-6 persons in an attractive holiday park 300m from the Atlantic coast. Property 16: Contemporary villa, 5 minutes walk from the village, 4. 5km from the sea. Spacious villa, situated in quiet cul de sac enclosed by private gardens. Property 22: Spacious villa, situated in quiet cul de sac enclosed by private gardens. The field of delights in Vendée, Gîte "Au bord de l'eau"
Property 27: The field of delights in Vendée, Gîte "Au bord de l'eau"
Large gite design upscale heated pool near beach. 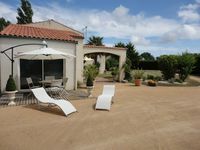 Property 28: Large gite design upscale heated pool near beach. Property 29: House in Le Bernard, 5 minutes from the beaches of Longeville S / Mer. Property 35: Gite 'Les Granges': beach, forest, salt marsh: all walk ! !